Instrument Tracking System: Does it Really Work? Considering the jump to automated instrument tracking often requires a lot of thoughtful research and analysis. Before making a decision, you have to figure out which systems could work best for your team, your processes, and your facilities. We recently sat down with Steve Teaford to do just that. At the time of this interview, Steve worked as the Regional System Educator for Sterile Processing for Mount Carmel Health Systems. With a bachelor’s degree in healthcare management, Steve started his medical career in the Navy where he served for 21.5 years. Upon retiring from the Navy, he accepted a Sterile Processing Manager position at Mount Carmel West and now works for Ohio State University as the Clinical Program Manager, High Level Disinfection and Sterilization. During our talk, Steve shared about his experience in his SPD management role and the differences of SPD life at Mount Carmel West before and after implementing an instrument tracking system. Q: Can you tell me a bit about Mount Carmel Health Systems and your role within it? A: Mount Carmel is a four-hospital system. In July of 2015, I was promoted to the Regional System Educator for Sterile Processing for Mount Carmel Health System. Now I am going out and reviewing processes at the sites, I’m educating the managers and the lead techs. Q: Have you worked with any other instrument tracking system? A: No, actually I have not. When I first got here we had a system called Encompass. Encompass was more of an instrument management system, which would let you manage the instrument and would provide you with count sheets, but it would not allow you to track the instruments to patients, or to where they’re located, or anything like that. Q: What was your experience with paper records and documentation? A: Paper records were the way we were doing business when we first started. We had to print out all of the count sheets [for assembling instrument sets], and then you stood there and checked off things as you built the tray. And then we would put that count sheet inside the set. 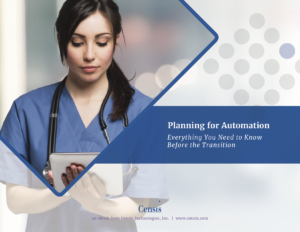 Transitioning to CensiTrac has eliminated all unnecessary paperwork for our team. Q: In a few words, how did the transition to a tracking system affect your overall workflow? A: Well it certainly improved it, I will tell you that. There was a little bit of resistance from the staff at first because they weren’t used to it, but once they started using CensiTrac and getting away from the extra paperwork, they found that this was a lot quicker and easier for them. Q: With all of the recent news on patient safety, what benefits would you say a tracking system provides? Do you feel a tracking system is necessary in today’s world? A: I think it’s definitely necessary, number one because CensiTrac forces you to say, “Hey—do I have all of my instruments there?” And then it will electronically provide documentation of all the steps that were completed during the assembly phase, making sure everything’s there. Q: What is the time difference between locating a specific instrument with a tracking system as compared to other methods, paper records, hybrid systems, etc.? A: When using paper records, we could have spent the entire day looking for a set. But with the tracking system, all you’ve got to do is look in the system for its last scanned location. Q: Was there a standard process for locating a lost instrument when using paper records? A: It was more like “Everybody stop what you’re doing,” and we went through all the shelves. Now we don’t’ have to do that, because one person can just look in CensiTrac and then go to that location and get the instrument, tray, etc. Q: Before implementation, what features were you looking for in a tracking system? A: We knew that, as a system, we needed to have the same software across all our campuses, so that we had the ability to assemble and track our sets, while managing all the data that the system captures, including productivity. So we went out and visited several sites and systems. Then came back the office and said, “Ok, which one of these systems is going to match our needs the best?” What we found was, a couple of companies wanted us to sign a contract related to dollars spent on instrument purchasing in order for us to get their equipment at a cheaper price. We reviewed another company’s software but we felt it just didn’t have the features that CensiTrac did. When we looked at CensiTrac we said, “Hey, hold on a second. Here’s a company that does nothing but deal with instrument tracking.” So we looked at CensiTrac and found that it met what we needed. It was able to let us track instruments and their locations at any given time, so people weren’t spending the majority of their day looking for something. It provided leadership with the ability to pull data and show productivity and hold people accountable with the [quality feedback] module of the system. A huge thank you to Steve for his time and willingness to sit down with us and share his experience on transitioning to an automated tracking system. If you’re curious to see how automated instrument tracking could work for you, check out our interactive map. It will walk you through each step of the process, from decontamination all the way to the operating room, to show you exactly how the system works. It costs on average $5 to file a paper document.